Princeton NJ -- Just two years after choosing to major in astrophysical sciences, senior Joshua Schroeder is making his own mark in the field. In January, he attended the annual meeting of the American Astronomical Society in Seattle and presented some of his research results to international experts. Senior Joshua Schroeder, left, worked with Professor of Astrophysics Jill Knapp to study unusual stars that have carbon compounds on their surfaces. Schroeder traveled to a meeting of the American Astronomical Society in Seattle to present a poster that describes the research. His work is part of the Sloan Digital Sky Survey, a sky-mapping project led by scientists at Princeton and other institutions. Schroeder was one of several Princeton researchers who attended the meeting and reported results from the Sloan Digital Sky Survey, a sky-mapping project led by scientists at Princeton and other institutions. Using a telescope in New Mexico, the Sloan survey is recording a detailed image of one-quarter of the sky, which is expected to yield data on several hundred million celestial objects. One of the Princeton studies revealed a new set of powerful quasars at the farthest reaches of the universe, while another analyzed very small and nearby objects called brown dwarfs. Schroeder's work combined his interests in chemistry and astronomy and revealed a new variety of star with tantalizing hints about the origin of life in the universe. Following up on work he began for a junior paper, Schroeder analyzed a group of stars that turned up in the Sloan survey data with surprising signs of carbon in their atmospheres. The standard thinking in astronomy is that carbon -- the element necessary for all life on Earth -- comes from supernova explosions and other rare dying stars that release heavy elements from their cores onto their surfaces. Recently, however, the Sloan survey found stars that have unusually high concentrations of carbon on their surfaces and appear to be at the prime of their lives. Schroeder and others analyzed the data for 10,000 stars and found 23 that fit into this new category. The findings do not mesh with current theories of star evolution, which suggest that elements heavier than hydrogen and helium should be confined to the star's core until the end of its life. "They're so abnormal it's hard to say exactly what they are," said Schroeder. "It's exciting to study such peculiar objects, and also there's always the idea in the back of your mind that carbon is the element that's so fundamental for life. It's interesting to consider the variety of conditions in which carbon compounds can appear." Schroeder displayed a poster describing the results during the meeting's "poster session" and explained the work to other attendees, which was a challenge because often those who stopped to ask questions were established experts in the field, he said. "It was a great experience. I really appreciated being able to go," said Schroeder, who is now following up on the work for his senior thesis. "It's great to be able to jump in and start running, and part of it is that the Sloan survey gives you so many opportunities." Another announcement at the meeting came from former Princeton graduate student Xianhui Fan, Professor Michael Strauss and other collaborators who discovered three high-redshift quasars, which are powerful light sources and were among the earliest objects to form after the big bang. Among the three is a new record for the most distant quasar. The scientists estimated the distances of the quasars with a measurement called redshift, an expression of how much the light from the object has been stretched during the expansion of the universe. The longer the light has been traveling through the universe on its way to Earth, the more it is stretched and shifted to the red end of the spectrum. The redshifts from the three new quasars indicated that the light had traveled for 13 billion years to reach Earth. The light originated 800 million years after the big bang, when the universe was just 5 percent of its present age. With these discoveries, the Sloan survey has now found the seven most distant quasars ever seen, providing scientists with enough ex-amples to begin a detailed study of these mysterious objects, said Strauss. These quasars are giant black holes -- 5 billion times more massive than the sun -- that produce a bright light as matter pours into them. Scientists now face the mystery of how such densities of matter formed so quickly after the big bang, which started the universe with a very smooth distribution of matter. "A black hole in space is the exact opposite of smooth," said Strauss. "Somehow the universe managed to form these dense lumps in an incredibly short time after the big bang." The discovery of these objects required precise techniques for picking faint red dots from the many specks of light recorded by the Sloan survey. The scientists had to sort through about 10 million objects for each quasar they found, said Strauss. Ironically, when the researchers narrow a quasar search to about 50 candidates, some of the closest matches turn out to be something very different -- diminutive objects called brown dwarfs. Spanning the gap between planets and full-fledged stars, brown dwarfs are so dim they can only be seen when they are in our own neighborhood of the galaxy. "It's fascinating -- you find both the farthest and the nearest objects in the same process," said astrophysics professor Jill Knapp. Knapp's group showed that brown dwarfs are less prevalent than theoretical estimates had suggested. At one time, said Knapp, scientists had suspected that there might be so many of these hard-to-see objects that they would add up to more than the mass of all the full-size stars. The Sloan data, however, shows that all the brown dwarfs probably add up to about 10 percent of the mass of stars. "They are the most numerous thing in the galaxy, but each of them has such a small mass that they don't add up to much," said Knapp. 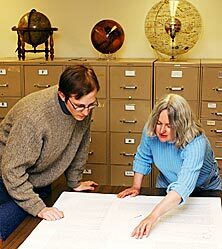 Knapp said the success of the study hinged on calculations done by graduate student Mark Collinge, whose theoretical calculations ensured the accuracy of the brown dwarf census. With the survey in hand, astronomers can now try to understand the physics behind the creation and evolution of these Jupiter-sized objects. Brown dwarfs appear to form like stars, but never accumulate enough mass to ignite the nuclear fusion reaction that fuels stars, said Knapp. Instead they simply cool until they emit no light at all. Thus the neighborhood of our sun probably has many of them floating nearly invisible in space, said Knapp. At least some of those will surely be found by the Sloan survey, which is about 40 percent of the way through its goal of mapping one-quarter of the entire sky.